HAMILTON, Bermuda, February 1, 2010 (ENS) – Marine scientists set sail from Bermuda on Thursday to document the extent of plastic pollution in the North Atlantic Gyre, a swirling vortex of ocean currents in the northern Atlantic Ocean. 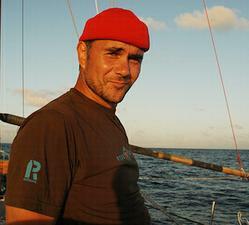 The scientists and crew are aboard the 72-foot sloop Sea Dragon sailing across the Sargasso Sea to the Azores Islands. The husband and wife team of California researchers, Dr. Marcus Eriksen and Anna Cummins, are the first to study the plastics that accumulate in all of the world’s five oceanic gyres. The gyres are formed by winds and currents in North and South Atlantic, the North and South Pacific and the Indian oceans. In these gyres, plastic food and water containers, toys, plastic bags, six-pack rings, condoms, fishing lines and nets discarded on land or at sea float and whirl endlessly, breaking down into smaller and smaller pieces but never completely disappearing. “The question we’re now looking into – do the chemicals on the surface of plastic particles get into the tissues of fish through ingestion, work their way up the food chain, and wind up on our dinner plate?” the Eriksen and Cummins told ENS in an interview. If these plastic particles do wind up on human dinner plates, they carry high concentrations of persistent organic pollutants with them. “Plastic particles at sea act as magnets for chemicals like DDT, PCBs, flame retardants and other pollutants,” says Eriksen. “Plastic particles can absorb chemicals that are “hydrophobic,” that is they don’t mix with water, but are “lipophilic,” that is they are attracted to oily substances, such as petroleum-based plastics,” he explains. “Pollutants like PCBs, DDT, flame retardants, pesticides, and other hydrophobic persistent organic pollutants can stick to plastic particles at high concentrations – up to a million times higher concentration than the seawater around them,” Eriksen says. “This is where plastic pollution can impact humans. We find plastic particles in the stomachs of fish that may mistake plastic for food, or be attracted to fish eggs or barnacles growing on pieces of trash,” the scientists said. Eriksen and Cummins are sailing the Sargasso Sea now because while the seas are rougher in winter, the summer brings hurricanes, a greater danger. Sailing out into the Atlantic, Eriksen and Cummins dropped their first collection trawl into the water and did not have to wait long for plastic debris to accumulate. They caught shredded plastic film, a milk jug ring, random pieces of plastic confetti, and nurdles, the scrap plastic resin pellets from production of plastic goods. At least 27 million tonnes of nurdles are manufactured annually in the United States. While potential human health effects of marine plastic remain unknown, scientists estimate that nearly half of all seabird species, all sea turtle species, and 22 species of marine mammals are harmed or killed by plastic waste, either from ingestion, entanglement or strangulation before the debris has been broken down into tiny fragments. The North Atlantic Gyre is the second of the world’s five gyres that Eriksen and Cummins have studied. 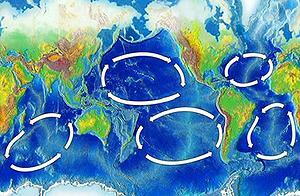 The 5 Gyres Project, a collaboration with the Algalita Marine Research Foundation, took them on a crossing of the North Pacific Gyre, a 10 million square mile patch of circulating current north of the Hawaiian Islands littered with plastic debris, often called the Great Pacific Garbage Patch. That voyage in 2007-2008 was made with Algalita founder and research coordinator Captain Charles Moore, who in 1997 first discovered the plastic trash endlessly swirling in the North Pacific Ocean. 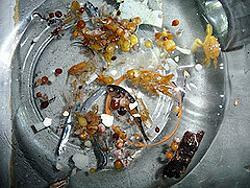 The voyage documented a doubling of the amount of plastic trash in the North Pacific Gyre in less than a decade. During the summer of 2008, Eriksen crossed the North Pacific again, from Long Beach, California to Hawaii, on the Junk, a boat he and Cummins built from 15,000 plastic bottles contained in recycled fishing nets and a retired Cessna 310 fuselage. 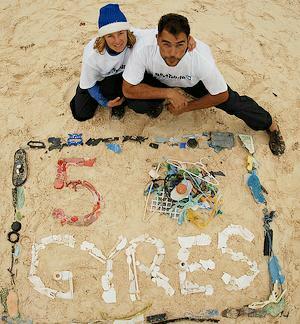 In August, they intend to cross the South Atlantic Gyre, which stretches from Rio de Janeiro to Cape Town, South Africa. This is expected to be the first such voyage in some 30 years in the Southern Hemisphere. Project Kaisei is a nonprofit organization based in San Francisco and Hong Kong, that works on marine debris issues. This coming summer, Project Kaisei will launch its second expedition to the North Pacific Gyre, sending multiple vessels to test an array of marine debris collection systems. A European environmentalist, de Rothschild and his team are building a sailing catamaran from plastic bottles at Pier 45 in San Francisco. Named the Plastiki, the catamaran will sail to the North Pacific Gyre when it is complete later this year. Eriksen and Cummins are loaning a trawl to the Plastiki crew so that they can collect plastic debris. The Algalita Foundation will process these samples so that the surface plastic they find can be quantified in a way that is scientifically valid. “We hope to bring global awareness to the issue of plastic pollution, and convey the idea that plastic isn’t just accumulating in the infamous Pacific Garbage Patch, but in oceans and on beaches around the world,” Eriksen and Cummins told ENS. “Once we gather our data from the North and South Atlantic oceans, we’ll communicate our findings through an East Coast cycling/speaking tour visiting schools, companies, legislators,” they said. It will be their second cycling/speaking tour. The couple celebrated their marriage last spring with a 2,000-mile tour from Vancouver, Canada to the U.S.-Mexico border, giving presentations about plastic pollution in the Pacific Ocean. Their next project will be their first in Europe, where the intrepid couple plans to go to Paris to build a boat called STRA from a million plastic straws, in which they intend to sail the Seine River and cross the English Channel. Theirs is not the first effort to document plastic debris in the oceans of the world, but it is the first to include all of the world’s five major oceanic gyres. A 2006 Greenpeace report that focused on the North Pacific concluded that, around 80 percent of marine debris is from land-based sources and the remaining 20 percent is from ocean based sources. “At least 267 different species are known to have suffered from entanglement or ingestion of marine debris including seabirds, turtles, seals, sea lions, whales and fish,” the Greenpeace report states. The U.S. National Oceanic and Atmospheric Administration Marine Debris Program has supported studies on the impacts of plastics to marine mammals, fish, and their habitats. 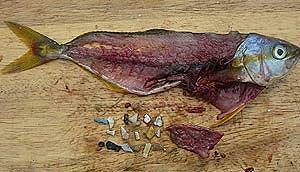 Many of these studies have dealt with plastic derelict fishing gear in the North Pacific. The SEAPLEX expedition, a group of graduate students from the Scripps Institution of Oceanography, spent 19 days on the ocean in August 2009 researching the Great Pacific Garbage Patch. In April 2008, Richard Sundance Owen, a building contractor and scuba dive instructor, formed the Environmental Cleanup Coalition to address the issue of North Pacific pollution by identifying methods to safely remove plastic and persistent organic pollutants from the oceans. Research projects are ongoing, but no one has begun to clear away the small pieces of plastic debris that pervade the world’s oceans. Eriksen and Cummins believe that it makes no sense to take plastic, a material designed to last forever, and make products from it designed to be thrown away. 5 Gyre Project’s title sponsor Blue Turtle is a San Francisco membership organization seeking solutions to polluted oceans worldwide through education, source elimination and clean up. Pangaea Explorations, another major sponsor, is focuesed on environmental discoveries and teaching respect for the environment. Additional sponsorship is provided by Ecousable, Quiksilver Foundation, Surfrider Foundation, Keen Footwear, Patagonia and Aquapac.